Dedication: A post for my little cousins, with big dreams. For all those who were my teammates at different points in time, (some who are pursuing their dreams as pros still) all of my coaches (who probably believed in me more than I did at many points), and my grandmother: my biggest cheerleader . I have rarely taken my camera to sporting events. Usually, I'm too caught up in living the excitement of the moment; but this was unique opportunity so I brought the camera along. John Isner, #12 in the world, fastest serve. Sam Querrey, #58 in the world. 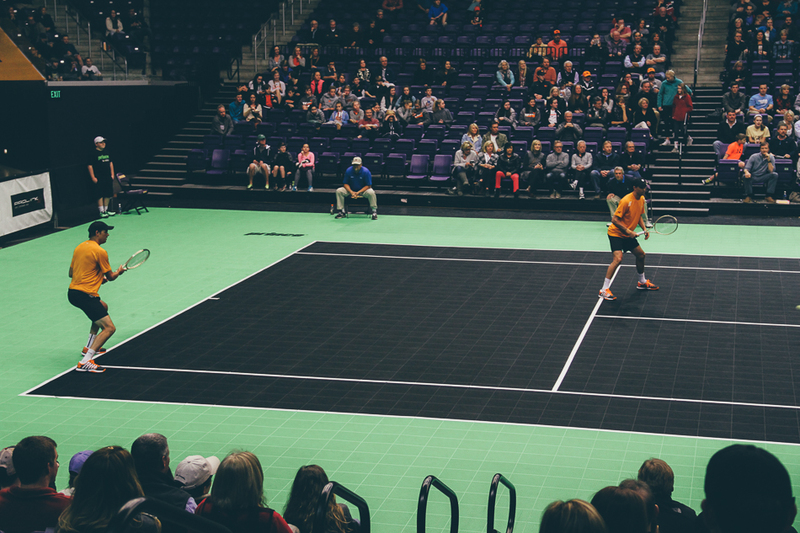 I love many sports, but I grew up playing competitive tennis. In the beginning of the 7th grade I began a new sport, chosen by my mother actually. I quickly picked it up, liked it, and decided I would pursue it competitively. Everyday after school I would ride the school bus for 40 minutes, quickly change and eat a snack in 10 minutes, and show up for practice for a couple of hours. On Saturdays I would wake up really early so I could get private lessons in. I spent several summers spending hours upon hours on the courts, watching Wimbledon in between practices. I was a determined teenager, and my teammates were also. I played the national tournaments and a couple of international ones, but nothing close to the pros. My dream and discipline was nothing close to some of my friends either, who really talented and really wanted to become professionals. The week I moved to the United States for college, I decided I would try out for my college's team, and I was allowed to walk-on. It wasn't something I had planned, I really didn't know what I was signing up for, but it was an experience that taught me a lot. We had a good team in college, there were far better players than me. But I made new friends, was challenged everyday, (especially those 5:30 AM workouts). I became a better player, and was in the presence of awesome players everyday. I learned how to be a better athlete by learning new habits (like running to stay in shape,etc..)...My journey of competitive tennis stopped after my freshman year of college, but a huge lesson I will never forget was to: "Be thankful I can run, jump, and play." (To this day, on days where my workouts get hard or when I'd rather go home and sit around, the phrase comes to my mind and I choose to keep pushing). I stopped playing competitively several years ago, but the game is still fun. Having a hitting partner in the same city the last year or so and coaching my little cousins when I've been home has been a good way to enjoy the game. To see other little kids have a dream and work hard despite their circumstances is encouraging. Their battles today are with a little green ball on a green (or blue or red) court, and a buddy across the way. These battles are ones that will prepare them for a big world out there. Bryan Brothers, have won 19 grand slams. Currently ranked #4,5 in the world for doubles. Sports instill a sense of passion, discipline and perseverance especially when there is loss. As I sat in the arena at Lipscomb University and saw that lime green ball go back and forth, I remembered my days on the court and was amazed that I was witnessing some of the best. Inside, I felt like a kid, excited as I would when my twelve or fourteen year old version watched Wimbledon from the TV by the courts. I never thought I would be this close watching top 10 players. While it was just an exhibition match and not a grand slam tournament or any other tournament on the tour, I was still in awe. As they signed autographs and took pictures with fans, I wondered about all the hours of hard work to get there. Tired after a sweaty match, they waited for a long line of kids and their parents (the occasional grown-up like myself), and smiled at the cameras. I guess that becomes a part of the job, when you are that famous and that successful. I doubt that was ever their motivation. As kids they probably just wanted to be #1. It all started with a dream, followed by countless hours of hard work. So whatever you are doing now, or if your children have a dream: keep going. Put in the hours, work hard, then get up earlier and work harder. Surround yourself with people who believe in you. If your dream fails (for uncontrollable circumstances), don't give up. Dust off the dirt & get up again, maybe you were made for a different thing, maybe its time for a new dream. Success in the eyes of the world fades, what's inside you is what matters, whether you gave it your all or lied to yourself in the process. Today, I have many goals, many dreams. Everyday, I keep reminding myself to live courageously, to keep having the discipline I had as a child, and enjoy the game along the way: the hard work will pay off in the end. 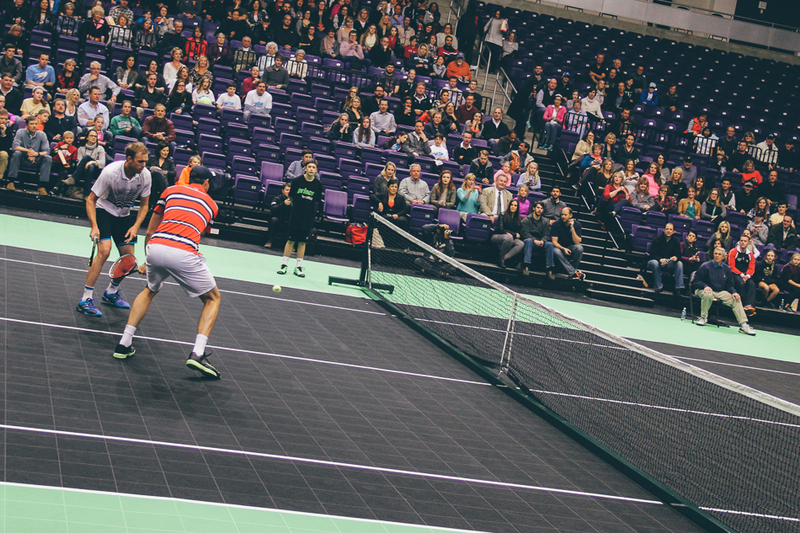 Watching a little bit of tennis magic on the court and being behind the lens was a dream. Thankful that Saturday was a day where I felt like a child once more. Thanks for stopping by. Hope you enjoyed this post. Did you know I now have photography prints for sale?